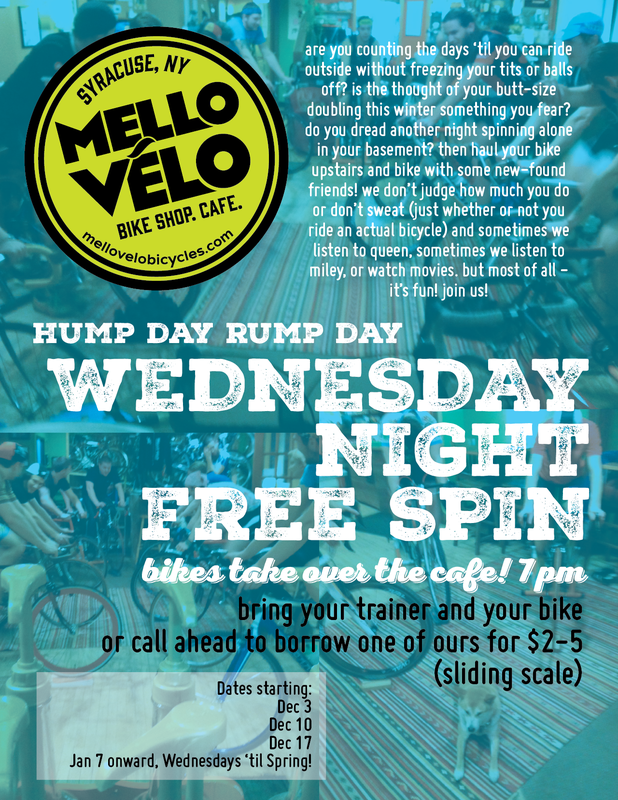 SPIN NIGHT will resume at our new home on Canal Street - look for schedule updates on this page! Spin nights are conducted using your own bicycle and a stationary trainer. We have a limited supply of store magnetic and fluid trainers, so call ahead to reserve yours. Depending on your bicycle, you may need to purchase a rear quick release skewer that is compatible with the trainer. We have used skewers available for $5. If you also need a bicycle, call ahead for availability. Spin sessions are casually led, and the type of workout varies throughout the spin season – they can be as hard or as easy as you want to make them. Suitable for the beginning cyclist, as well as avid riders aiming to up their fitness level for the coming season, our spin sessions focus on fun and camaraderie.